There is a lot of hype about the future of work, but many of the changes we will see in 2015 and in future years are already taking shape. What we will experience is their acceleration as change continues to be the only constant in our world. Those leading with 21st century practices of abundance and possibilities understand that aligning people around shared purpose and simplifying work is at the heart of their success. Power is shifting to the individual who now has 24/7 access to tools and information, which also means they have a much louder voice. An increasing number of employees are bringing new technology to work as IT departments continue to face an overwhelming abundance of devices and the challenges of mobility. The new consumer is always connected, shares their opinions, has an abundance of choice, requires immediacy, seeks authenticity and values responsibility. What will emerge in 2015 is that the characteristics of the new employee will increasingly reflect those of the new consumer, especially with the increasing shifting demographics in the workforce. Younger generations like Millennials and Generation Z will make their workforce entrances, and they will bring different needs and expectations to work. We will also see an increase in contingent workers who will change how work is done. Re-imagining our relationship with work. Not only is the world changing quickly, but work as we know it is also making some changes that will become more significant in 2015, which is a year of transformation. In Canada, we will still see many work environments that require 9 to 5 workdays but in other parts of the world, there will be a vast increase in the need for flexible schedules, when possible, because it’s what knowledge workers want. In 2015, 21st century leaders will take the opportunity to re-examine what work means to their employees. It’s time to shelve the annual employee survey and introduce ongoing two-way communication into the workplace. The only way to re-imagine work is to adopt the 21st century tool of conversation and say goodbye to the 20th century world of meetings for the sake of meetings. Realizing that people are the killer app for the 21st century. And no, “people” is not the name of a new app. It is the realization that we need to stop thinking about headcount and start realizing that our workplaces will require human beings to get work done. Organizations that build teams around shared purpose will find their business flourishing as thousands of unnecessary hours will no longer be wasted on endless meetings and information sharing. People will actually understand how their role drives a shared purpose– their ability to collaborate with others to drive results. 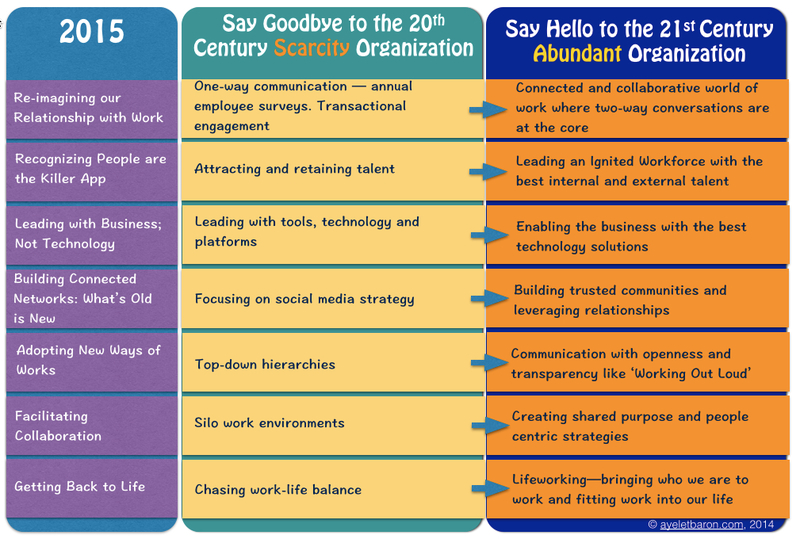 The 21st century leader will simplify work and create opportunities for greater collaboration. Stopping the insanity: It’s not about the technology. CIOs need to continue to be proactive around changing security and mobility demands that the workforce will place on their infrastructure. They will also need to experience a mindset shift in 2015 on how to use technology as an enabler of the business and to stop leading with technology. People in 2015 will expect the technology to work and will want the same ease they have outside the workplace to connect with colleagues inside their organizations. They will need to be increasingly educated about security. How will you lead the 21st century organization? Of the following, which will you focus more on in the next 18 months? Building connected networks is key to survival. Most leaders in large organizations do not know what talent they have within their organizations, and the same top performers continuously get rewarded with more work and special projects. As the contingent workforce increases and more employees will choose to become free agents, it will be increasingly challenging to find people with strategic skill sets. Using existing social networks as an enabler to creating relationships will become increasingly important. What’s old, like creating trust and building relationships, will become new again. Connected networks will also become increasingly important to build trusted communities of employees, where collaboration can accelerate the business. Partnerships with customers will also become increasingly important, as some will seek more personalized experiences. It’s time for business to start learning from the sharing economy. As that economy goes mainstream, an increasing number of people will share their expertise, their stuff, and work in a new form of collaboration. Senior leaders will start incorporating into their strategies the need for new ways of working. They will understand that changing demographics like the younger generation should be viewed as an opportunity to innovate how we work instead of exacerbating their stress levels. My hope is that we will shift from focusing on platforms and bring back business common sense when it comes to how these platforms can help us realize our shared purpose. We will adopt methodologies like “Working Out Loud” and reduce our reliance on email. We need to think about what mobile devices and applications allow us to do, like having the flexibility to work from anywhere. The 21st century leader will know the world is open and that social networks facilitate collaboration between billions of people. We live in an open world and it is as big or small as our imagination. Human collaboration is making an important comeback to the world of work. If you are in healthcare, for example, patient-centricity will become increasingly important with organizations trying to be more empathetic to patients’ needs as we move towards more personalized medicine. Organizations will continue to integrate human-centred design and it will no longer be a buzzword, but will become a business model to develop innovative, real-time solutions for real world problems. The 21st century leader will have the design capabilities to bring agility and nimbleness to the workplace by listening and becoming more responsive to a personalized world. Lifeworking will replace the fallacy of work-life balance. Both the younger generation and people in their 40s, 50s and 60s will start shifting their notions of how work fits into their lives. An increasing number of people will want to bring who they are to work, which will require 21st century organizations to introduce new programs from flexible schedules. It will also mean organizations will need to know how to access the best talent inside and outside the organization. Technology can increasingly enable organizations to meet the increasing needs of lifeworking. The 21st century leader will realize that we can no longer leave our personal selves at home and he or she will value a new world definition of diversity.